The Crabbes River property is 606 acres (245 hectares) of forest intersected by the Crabbes River. The native forest is a mix of black spruce and balsam fir, with several impressive yellow birch. Formerly part of the provincial Private Woodlot Management Program, NCC’s stewardship of the property includes management and restoration to maintain the health of the forest. The majestic Crabbes River and its tributaries that run through the property are a robust riparian ecosystem. 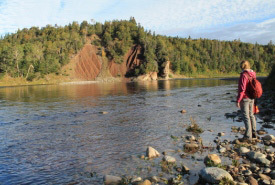 An analysis of data from the Atlantic Canada Conservation Data Centre revealed that a number of rare plants are found in the riparian habitat of the Crabbes River, both along the headwaters of the river and in the lower estuary. In addition to the unique flora present along its banks, the Crabbes River hosts wild Atlantic salmon and is a provincially scheduled salmon river. NCC’s Crabbes River property has a rich human history. The lot was sold by Robert G. Reid to Sir William C. Van Horne of the Canadian Pacific Railway (CPR) in 1900. Sir William C. Van Horne was a CPR railway official during the height of rail expansion in Canada. Some of his accomplishments include leading the rapid expansion of the main line railway through the prairies, launching the Empress line of Pacific steamships and founding the famous CP Hotels. The property had been held within the Van Horne family since it was registered in 1918. The Crabbes River Nature Reserve can be accessed off of the T’Railway or from Highway 405, near St. Fintan’s.